M. de Mauméjan; (his estate sale, Lacoste and Henry, Paris, 29 June-2 July 1825, no. 47). Miss E.M. Linton, Upper Basildon, Berkshire, England; (sale, Christie, Manson & Woods, London, 1 July 1955, no. 154); (David M. Koetser Gallery, New York, London, and Zurich); sold 1957 to the Samuel H. Kress Foundation, New York; gift 1961 to NGA. Georges Isarlo, Caravage et le caravagisme éuropéen, Aix-en-Provence, 1941: 263. Miss Linton's name was kindly supplied by Marijke Booth of Christie's Archive Department, London (e-mail to Anne Halpern, 5 December 2007, NGA curatorial files), as was the buyer's name from the auctioneer's book: H. Levat (or Cevat). "Levat" was perhaps buying for, or a pseudonym for, David Koester, who wrote to Colin Eisler (letter of 20 January 1969, NGA curatorial files) that although he had "not kept a record of [the painting's] exact source," he did recall that "he purchased the painting at Christie's, presumably in 1955 or 1956." Exhibition of Art Treasures for America from the Samuel H. Kress Collection, National Gallery of Art, Washington, D.C., 1961-1962, no. 101. The Splendor of Ruins in French Landscape Painting 1630-1800, Allen Memorial Art Museum, Oberlin College, Ohio; The Museum of Fine Arts, Houston, 2005, no. 36, repro. (shown only in Oberlin). Isarlo, George. Caravage et le caravagisme éuropéen. Aix-en-Provence, 1941: 263. Pigler, Andor. Barockthemen: eine Auswahl von Verzeichnissen zur Ikonographie des 17. und 18. Jahrhunderts. 2 vols. Budapest, 1956: 2:34-36, 174-175. Picart, Yves. La vie et l'oeuvre de Simon Vouet. 2 vols. Paris, 1958: 29, pl. 30. Manning, Robert L. "Some Important Paintings by Simon Vouet in America." In Studies in the History of Art Dedicated to William E. Suida on His Eightieth Birthday. London, 1959: 294-303, fig. 9. Walker, John, Guy Emerson, and Charles Seymour. Art Treasures for America: An Anthology of Paintings & Sculpture in the Samuel H. Kress Collection. London, 1961: 141, repro. pl. 132. Crelly, William R. The Painting of Simon Vouet. New Haven and London, 1962: 89, 186, no. 83, fig. 177. Walker, John. National Gallery of Art, Washington, D.C. New York, 1963 (reprinted 1964 in French, German, and Spanish): 315, repro. Summary Catalogue of European Paintings and Sculpture. National Gallery of Art, Washington, 1965: 138. European Paintings and Sculpture, Illustrations. National Gallery of Art, Washington, 1968: 125, repro. Leclair, Anne, and Pierre Rosenberg. "De Jean Dubois à Louis-Jacques Durameau: Note sur la Chapelle de la Trinité de Fontainbleau." Bulletin de la Société de l'Histoire de l'Art Français. Année 1972 (1973): 17 note 3. Pigler, Anton. Barockthemen: eine Auswahl von Verzeichnissen zur Ikonographie des 17. und 18. Jahrhunderts. 3 vols. Rev. ed. Budapest, 1974: 2:35-36, 184-185. European Paintings: An Illustrated Summary Catalogue. National Gallery of Art, Washington, 1975: 370, repro. Walker, John. National Gallery of Art, Washington. New York, 1975: 313, no. 411. Eisler, Colin. Paintings from the Samuel H. Kress Collection: European Schools Excluding Italian. Oxford, 1977: 261-263, fig. 245. Walker, John. National Gallery of Art, Washington. Rev. ed. New York, 1984: 313, no. 408, color repro. European Paintings: An Illustrated Catalogue. National Gallery of Art, Washington, 1985: 429, repro. De Lavergnée, Arnauld Brejon. 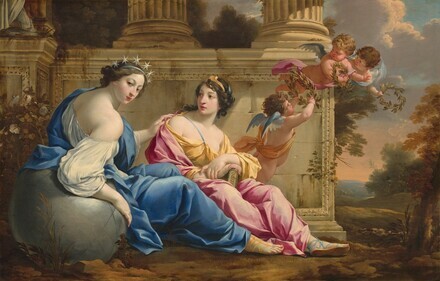 "Une série de Muses de l'atelier de Simon Vouet." In Ex Fumo Lucem. Baroque Studies in Honour of Klára Garas. 2 vols. Budapest, 1999: 167-180, fig. 5. Conisbee, Philip, et al. French Paintings of the Fifteenth through the Eighteenth Century. The Collections of the National Gallery of Art Systematic Catalogue. Washington, D.C., 2009: no. 97, 461-464, color repro.